Home / brand new / brand new artist / música / Smith & Thell / Swedish Jam Factory / Smith & Thell Unveil New Single "Forgive Me Friend"
Smith & Thell Unveil New Single "Forgive Me Friend"
Happy Saturday everybody! I've got a musical gem for you!! 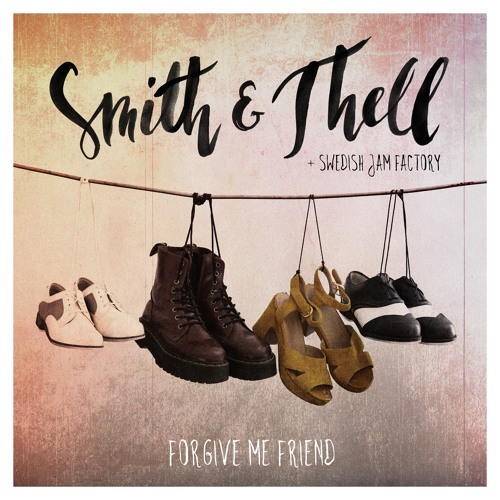 Swedish Folk-Pop duo Smith & Thell, comprised of Maria Jane Smith and Victor Thelll, have just unveiled their brand new single Forgive Me Friend. This is a perfect song to give you an energy boost! If you're into Mumford & Sons and Of Monsters and Men, then you'll love these guys. The song is packed with lush guitars and infectious percussion. I am loving their smooth and soulful vocals which compliment each other perfectly. The anthemic chorus will get you singing along to this gem in no time. Forgive Me Friend features multi-instrumentalist and step dance duo Swedish Jam Factory, based in Los Angeles and Memphis, who were one of the 16 semifinalists of this year’s edition of the Swedish TV show Talang on TV4. The song has a captivating energy and just puts a smile on my face (Even though the lyrics aren't as feel-good as the music). I am so happy to share this song with you guys, it's just amazing!! Stream it below! The song is about a friendship that went sour. About being young and naïve and thinking that you’re never going to change. About falling down a black hole and not having the energy to take care of those who mean the most to you, and still looking back afterwards thinking you should’ve acted differently, even though you know it’s too late.